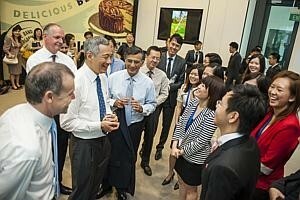 THE consumer businesses industry is a growth sector that Singapore is developing to tap the rapidly growing middle class in Asia, said Prime Minister Lee Hsien Loong yesterday. This high-value sector fits well into the country's knowledge-based economy and overall global connectivity, he said at the opening of global consumer goods giant Unilever's corporate university campus here. Called Four Acres Singapore, this global leadership and talent development centre in Nepal Hill is the Anglo-Dutch company's first such campus outside the UK. In his speech to some 200 guests, Mr Lee cited Four Acres Singapore as an example of the strong emphasis that good companies place on talent development, and serves as a reminder that countries, too, need to develop their own people well. "This is true for all countries, big or small, and regardless of how resource-rich or resource-poor they are," he said. He made the point that attracting, grooming and retaining talent "is more important than ever" in a highly globalised world. Even as major economies such as China and India are fast realising the need to attract good people, Singapore has long recognised the importance of doing so because "people are our only resource", he added. The Singapore government has thus made education, lifelong learning and development a national priority, he said. "Most importantly, we want to keep Singapore an exciting and vibrant city, so that talented Singaporeans will want to stay here to pursue new opportunities, create new successes and improve life for all Singaporeans." At the ceremony yesterday, the Prime Minister also announced that Unilever was the latest recipient of the Singapore government's Distinguished Partner in Progress award. Administered by the Economic Development Board (EDB), this corporate award is given to companies that have made outstanding contributions to Singapore's economic growth. Unilever is one of just three firms to be honoured this year, the other two being logistics company DHL and technology company IBM. "Unilever has been a valuable partner to Singapore. It has grown its presence here, and now manages strategic global functions such as brand development and supply chain management out of Singapore," said Mr Lee, noting that Unilever had also created many good jobs for Singaporeans. Unilever's chief executive Paul Polman said his company, which began operations here way back in 1954, was "deeply committed" to Singapore, where it employs 850 people. "This is a key strategic hub for our business and we look forward to a long and successful future here." Going by the latest estimates from the EDB, Singapore's thriving consumer packaged goods industry is expected to create 2,400 jobs and S$2.1 billion of value-added in the next three years. Besides Unilever, other well-known consumer companies that have anchored themselves here include French cosmetics group L'Oreal and Swiss flavouring and fragrances manufacturer Givaudan.